At a press conference, Karachi police chief Amir Sheikh said the men arrested confessed to their role in facilitating the three attackers, who were also killed during the attack on the consulate. KARACHI/NEW DELHI: Pakistani police on Friday accused Indian spy agency RAW of being involved in the November terrorist attack on the Chinese consulate in Karachi, a charge rejected by India as "fabricated and scurrilous". 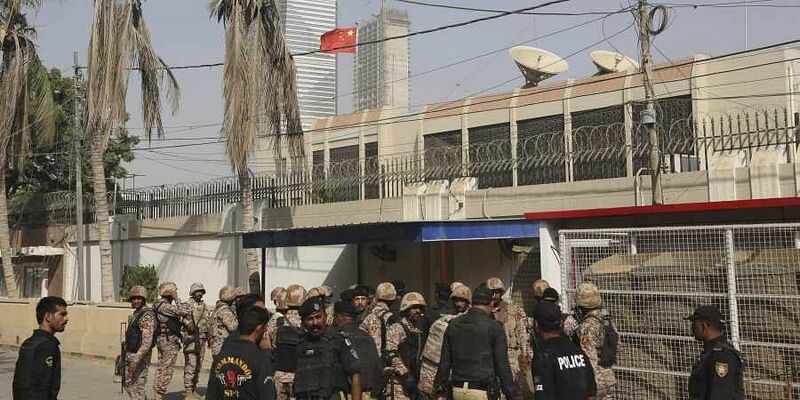 Karachi police said they have arrested five suspects from a separatist Baloch group for the November 23 attack on the Chinese consulate that killed four people, which they claimed was carried out to "sabotage" the China-Pakistan Economic Corridor (CPEC). Shaikh claimed that the attack was planned in Afghanistan and executed with the help of India's Research and Analysis Wing (RAW). Reacting to the Pakistani claim, a spokesperson of the Ministry of External Affairs in New Delhi said, "We have seen statements in the Pakistani media attributed to the police chief of Karachi making false allegations against India for the terrorist attack on the Chinese consulate in Karachi in November 2018. We completely reject these fabricated and scurrilous attempts to levy accusations on India. Instead of maliciously pointing fingers at others for such terrorist incidents, Pakistan needs to look inwards and undertake credible action against support to terrorism and terror infrastructure in its territories". Sheikh said the detainees were linked to the Baloch Liberation Army, a Balochistan-based group which had claimed responsibility for the attack at the time. Three militants tried to storm the consulate in the city's posh Clifton area but security forces foiled their attempt by killing all of them in a gunbattle. The attack also killed two police officials and two visa applicants. "The aim was to sabotage the China-Pakistan Economic Corridor and create the impression in China that Karachi is not safe," he said. India has opposed the CPEC as it passes through Pakistan-occupied Kashmir (PoK). The ambitious USD 60 billion CPEC project connects China's northwestern Xinjiang region to Pakistan's Arabian Sea port of Gwadar. India had strongly condemned the terror attack on the Chinese consulate and said such strikes only strengthen the resolve of the international community to combat terrorism in all its forms and manifestations. "There can be no justification whatsoever for any act of terrorism. The perpetrators of this heinous attack should be brought to justice expeditiously," the Ministry of External Affairs had said in a statement last November. Shaikh said that police arrested five facilitators and claimed that a probe based on their interrogation and other evidence proved the involvement of India. He said the terrorists spent four to five months in observing the consulate and its working. "They (terrorists) used to sit in the visa section of the consulate to observe when the gates open and other details," he said. He said that the weapons were transported from Quetta to Karachi through train and were hidden in the engine of a boat. Shaikh said the mastermind of the attack, Aslam alias Acho, was reportedly killed in a suicide blast in Afghanistan. However, he said he was not ready to believe it until there was proof of Aslam's death. He said it was an old tactic of militants to show a wanted rebel killed in order to divert the attention of security agencies. Of course India denies this.But we know India is supporting anti CPEC activities.